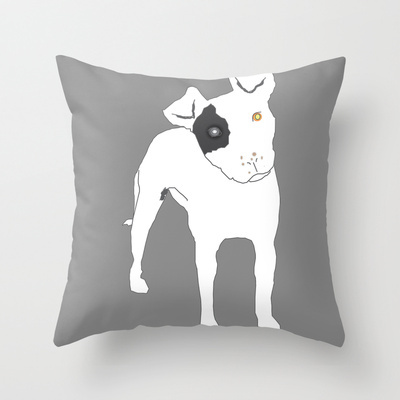 I’ve finally gotten around to putting my photography and art up on Society6. While I could technically take care of getting prints made, it’s a lot easier to outsource it. I don’t have to worry about making/obtaining the print, shipping, etc and Society6 can offer products that I can’t such as iPhone cases, tote bags, throw pillows and the like. I mean seriously can you resist a Piper Pillow? I want to order one for Piper! I haven’t been to the Gnomery in 3 days! It’s a bit weird, but I am working “out of the home” on some illustrations for an upcoming project. I used the Microsoft Surface Pro 2 yesterday to work on one of my pieces and it was AWESOME. It was like a mini Cintiq! We have the 256G model with 8GB of RAM. Um seriously, I was so jealous. It’s a tablet that is better than both my lappy (6GB of RAM) or my desky (only a piddly 2GB of RAM)! 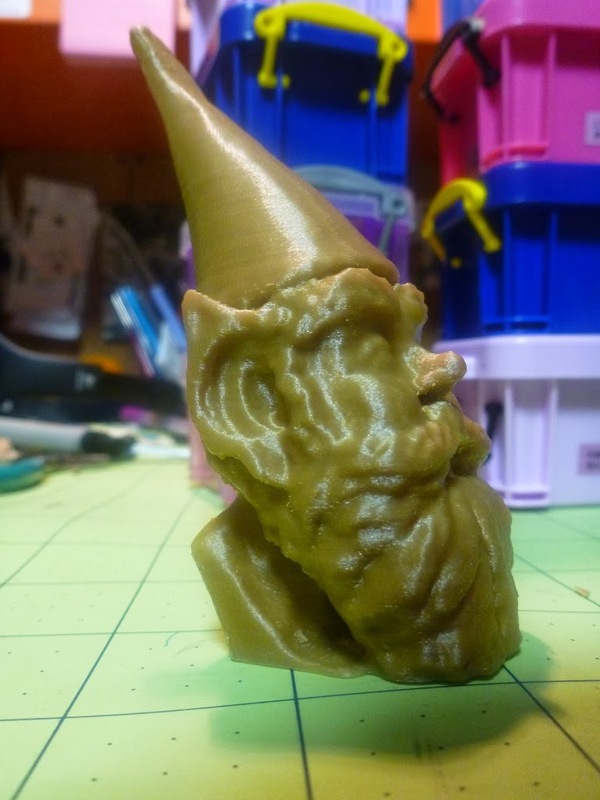 The ElderGnome managed to get his hands on one and they have been out of stock FOREVER! We got it to use with the Sense 3D scanner (the Surface Pro 2 has USB onboard) but it’s also AMAZING for PhotoShop and Illustrator. There’s a bit of adjusting (I’m used to full keyboard and the Wacom Intuos 4) but I really loved the performance. The only problem I ran into was serious arm pain today. The screen isn’t as large as my Intuos surface (or any of my sketchbooks), so I was using a lot more fine motor control, which causes my arm and hand pain to flare up. On the 3D printing front, Justin was insanely excited by the beta release of MatterControl, a new printer controller. I haven’t had a chance to see it in action but Justin was super excited when he called me from the shop about it. In reviewing the features, I can see why he’s excited. It’s “plug & print”, which he probably isn’t super thrilled about but new users will be. SMS and Email notification – That’s a pretty big deal. Knowing a print is complete (or not), helps us plan our day a bit more accordingly. Say we go home for the night, it will be great to know if the print is actually done instead of going in and hanging out until it finishes (also great if you need to go out to lunch or run errands). Drag and Drop queuing – Drag and drop always makes things flow a bit better. Design Library – This is pretty sweet. It allows you to organize and store your print files. Advanced Plating – This is pretty exciting. Automatically detect multiple parts within a single design file and then individually manipulate, scale, rotate, and mirror those parts. Like I said, I haven’t seen it in action yet, but it sounds pretty awesome. I think the feature that was most exciting (to Justin, Elijah and possibly Levi) was that you can name your printer(s). That might not seem like much, but when you have 5 printers running, names help instead of COM PORT numbers. In fact, we’re having a naming contest. 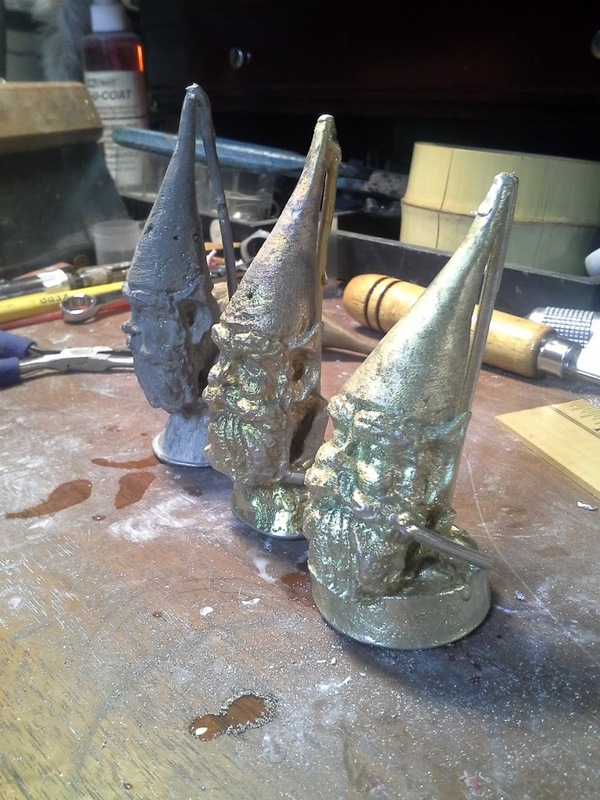 Suggestions can be made on the LaserGnomes Facebook page. I haven’t forgotten about my reviews of 3D modeling software. I really haven’t. But it’s been quite exciting around here nonetheless. 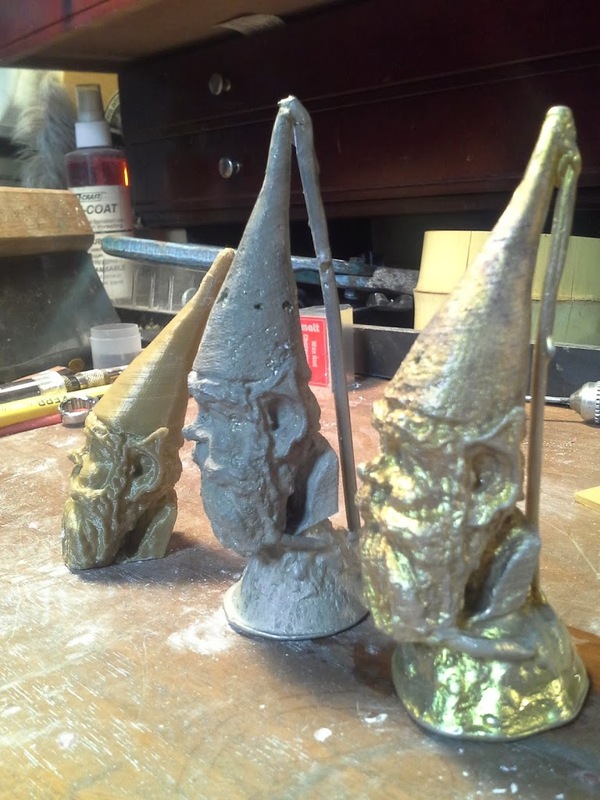 The Gnomery is moving. We picked up keys and started moving furniture in today! I spent much of yesterday working with ComposiMold, which I had come across at MakerFaire earlier this year. It’s a reusable molding compound for making a variety of molds (including 2 part, push molds and more). It comes in a variety of formulations, including FC, or food contact. I ordered my ComposiMold through Amazon and it arrived in 2 days as Prime Shipping usually does (I say usually because I had one item show up like 5 months later after a replacement had already been sent out). 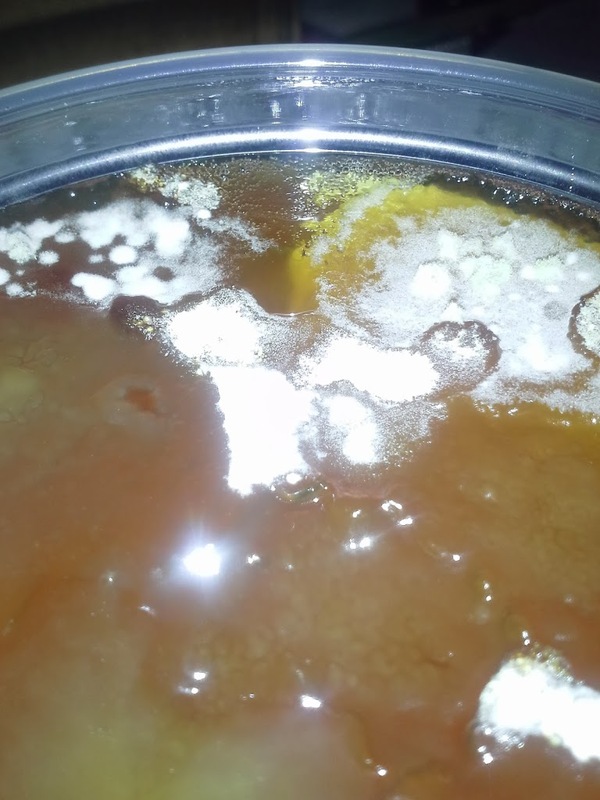 Unfortunately, the top of the container was contaminated with mold! I was totally bummed and reached out to ComposiMold on Facebook. Granted it was like midnight when I posted the pictures, I didn’t really expect anything to happen right away. Well, when I got up the next morning, I had two responses to my post and a separate email from ComposiMold. They apologized profusely and have issued a replacement AND refunding my original purchase price in order to make things right. Later in the day, I even received a voicemail from Sean at ComposiMold apologizing for the situation. Even though my initial experience was less than stellar, they have worked really hard to make it right. It is really rare to find good customer service (let alone any customer service) these days, it was awesome to have a company be so responsive to a problem. I can’t post any pictures of the project since it’s Christmas and all (don’t want to give away the goods!). I’ll post pictures once I’ve given the gifts. We picked up some furniture from Moving Sale (our local second hand shop), including a super sweet whiteboard set up! Unfortunately, it was about 5 pm when Rod got into town with the kiln hoods so traffic was horrendous getting out of the city. I think it took more than an hour to get there (The ride home took less than 20 minutes without traffic). 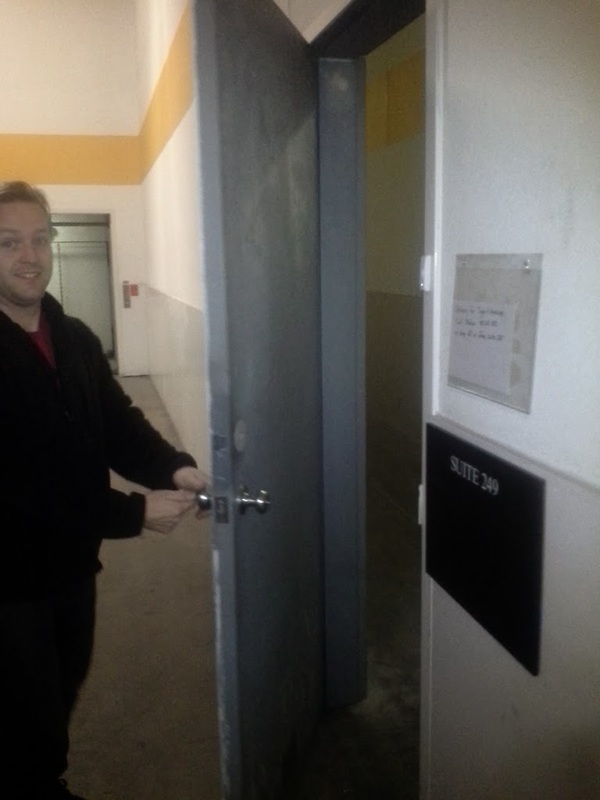 Justin opening the door with our key for the first time! Our spot. 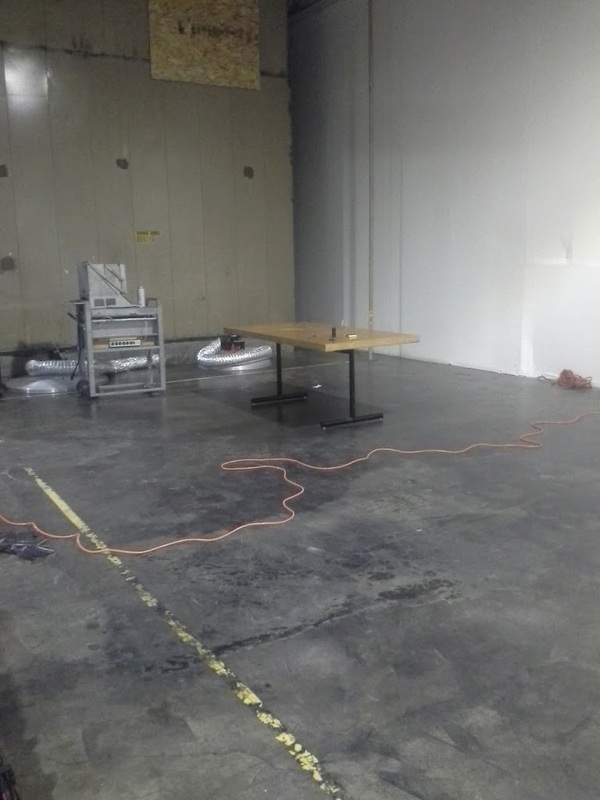 The room is about 8k sqft and we have an area about 18′ x 34′ with room for expansion. I can’t tell you how exciting this is. A year ago, we were getting our 3D printer. We had a dream to put it to work for us. We didn’t know how we were going to do it, but that was the plan. We’ve had our ups and downs with the printer itself. In fact, take a look at my first post, Type A Machines Series 1, it was quite the learning experience. A photo from my first blog post about 3D printing. 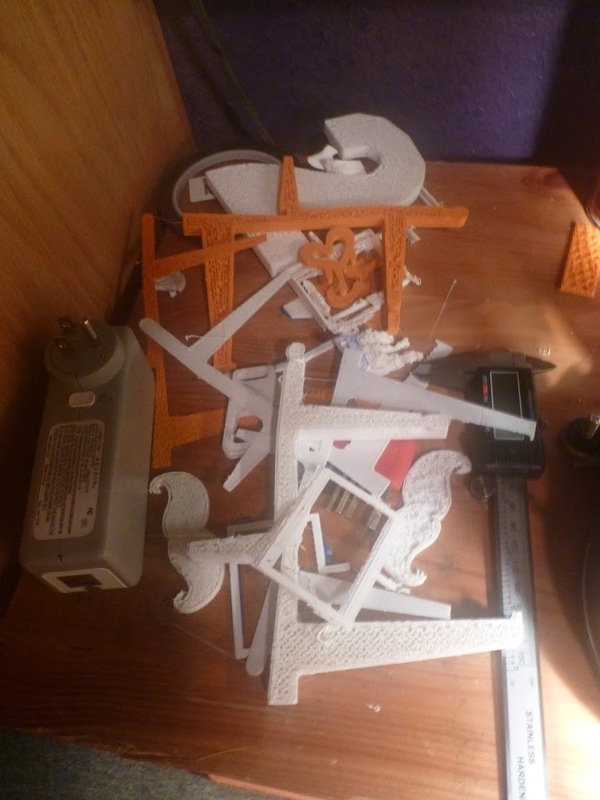 Our failed print graveyard. It got larger, much larger over the last year. Today we are setting up our future. We had an idea and we’ve stuck it out. We have gone from the above results to print on demand fulfillment, including 3D scanning and metal casting. Some didn’t have faith in our dream but we did and now it is paying off. My husband’s perseverance through this project has been nothing short of amaze (and yes, I meant to type amaze). Sometimes it has been nerve wracking. My poor husband stays up all night working. I have felt tremendous guilt for being busy with an outside job and school, but we’ve pressed on. Big things are happening and I’m filled with gratitude to be a part of it. We went to check out the new facility in San Leandro today, which is BEYOND exciting! I’m trying to figure out school for next semester, which is sort of frustrating. SFSU still hasn’t requested transcripts, so I’m not entirely certain what is transferrable from AAU. I know what transferred from Los Rios Community College, so that helps a bit, but some of the core classes I have no idea if I actually need to take them or not. I’m going to go down to campus tomorrow to pay tuition and see if I can get together with an adviser or at least someone in admissions/records to help me out. I have a rough plan, but I’d rather have it taken care of so it’s one less thing to worry about. With checking out our new space today, it’s really coming at us fast. It’s exciting and scary at the same time. I have orientation for school on Saturday, but I would like to have an idea of what my schedule will be like so I can figure out where/when I can be of use when we start kicking into gear. I’m a planner a lot of the time. I like to have an idea what is going on. I usually have classes registered for the second they are available, but my lack of readily available immunization records prevented that. I’m 34. It’s not easy finding records from shots I got when I was like 7. My pediatrician went out of business ages ago. Instead, I had to pay $100 to have a blood test performed to prove I had my MMR vaccine like 27 years ago. That meant I risked having the results come back showing that I have no immunity. Which would have meant get the immunization (again, pricey on top of the test I just paid for) or find a doctor that would write me an exemption. Thank Jeebus it came back that I have immunity. One less worry (I was concerned about finding a doc that would give me an exemption!). I have the Hep series from when I was a firefighter and I did get a TDAP in 2009. I’m still working on the 3d modeling software trials. 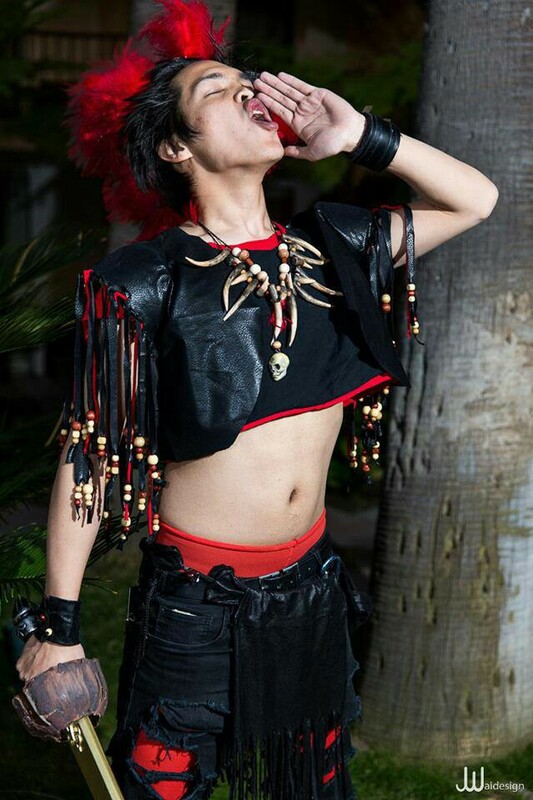 That was what I did for the Rufio costume and it worked out well. But I’m super determined to learn how to model. Especially when I see the possibilities for what I want to do design-wise. I’ve got finals tomorrow and Tuesday. I’ve got Orientation on Saturday. Le Midge’s birthday is next Tuesday. Christmas is next Wednesday. We’ve got people asking about our New Years plans. We have barely even thought about Christmas, aside from sweet, delicious tri tip at my mom’s. I’m still playing around with Curvy3D. I am going to work with Justin to try to come up with good evaluation tools from his standpoint (i.e., how the models will work for printing, etc.) 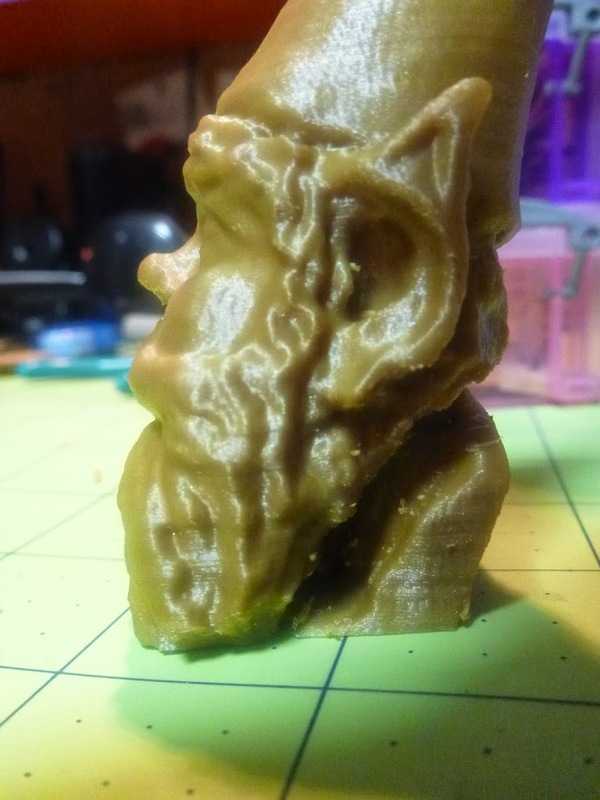 to try to evaluate if the program works for our overarching needs, not just my desire to make organic shapes (really, what good is the model going to be if it doesn’t print?!). 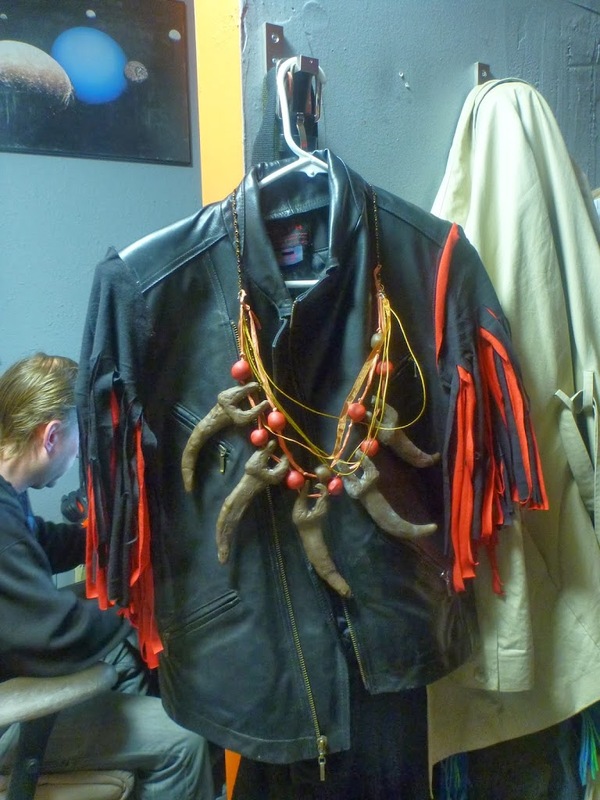 The other project I was working on was the Rufio costume for a friend. 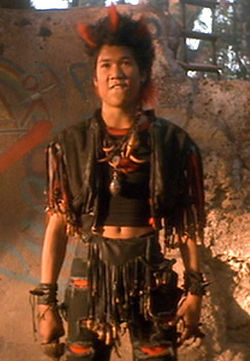 A friend approached me yesterday afternoon with the need for a Rufio costume for a party that started at 4 pm today! Not sure who Rufio is? A character from 1991’s Hook. A bit random, right? Especially for a Christmas party. 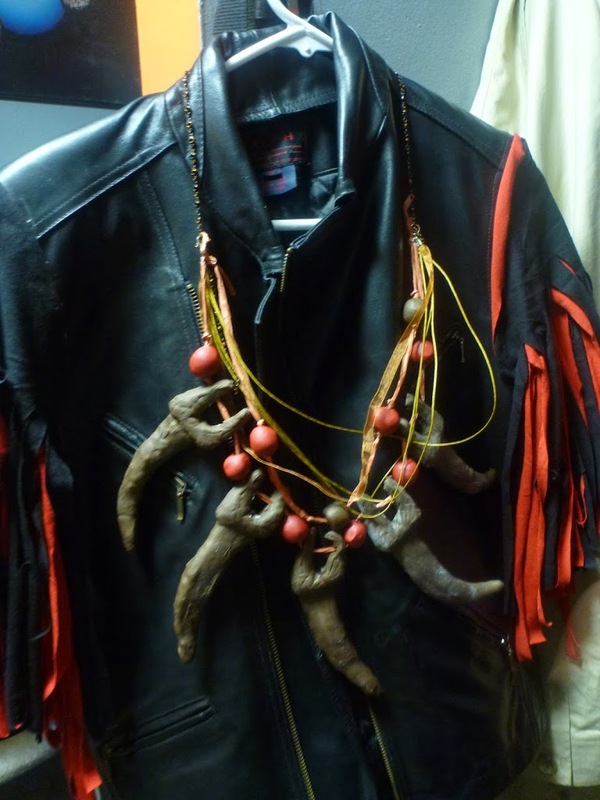 I altered the jacket and made the necklace, including the beads. Not bad for such a quick turnaround. So with that taking up a bit of time (but amazingly not as much as I expected), I played around with Curvy3D. Keep in mind, my area of design is 2D. I’m great with Illustrator, Photoshop, etc. I have the hang of TinkerCAD as far as 3D goes, but I am, by no means experienced in 3D modeling. I have played a bit with Inventor (Autodesk) and AutoCAD (Autodesk). I really want a program that I can pick up my stylus and “draw”. I played a bit with Sculptris but didn’t really “get it” super quick (I will return to it after playing with Curvy3D). Is this what our alien overlords will look like? So this was created using some basic tools including “Create Cylinder”, “Pull Tubes”, “Add”, “Sub” and “Smooth”. I didn’t really have a plan and wasn’t entirely certain what I was doing, I sort of started “pushing” and “pulling” the clay and playing around with it. 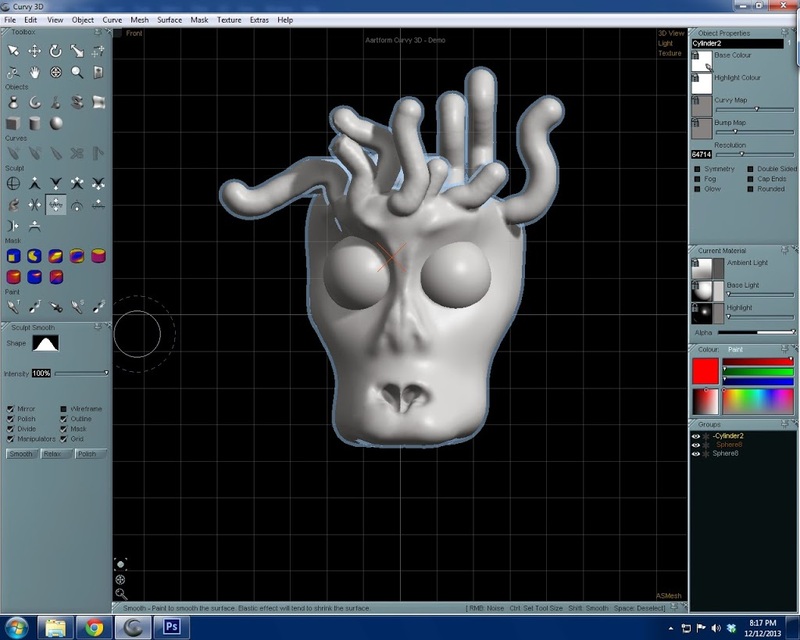 I’ve exported it as an .obj file so Justin can evaluate it’s usefulness in 3D printing. He’s currently working on a 3D printed trailer for a trailer park (the things people want), so I’ll probably have a better idea as to the immediate usability of the model tomorrow. On an aside, I’m not exactly sure when my entire Pinterest feed began getting flooded with fashion and mens grooming products (pretty sure the grooming products being as hipstery as they are are courtesy of Shoppe Mob). I’ve got to start following some better boards. I’m trying to find a 3D modeling software that is relatively easy for a beginner to navigate. Everyone knows how much I love TinkerCAD but for a lot of what I want to do, it can’t create organic shapes. You can only do so much creating .svgs in Illustrator and importing into TinkerCAD. I can’t chamfer or bevel, I can’t create fillets. I can use Autodesk’s Inventor or AutoCAD but I really want to work organically. 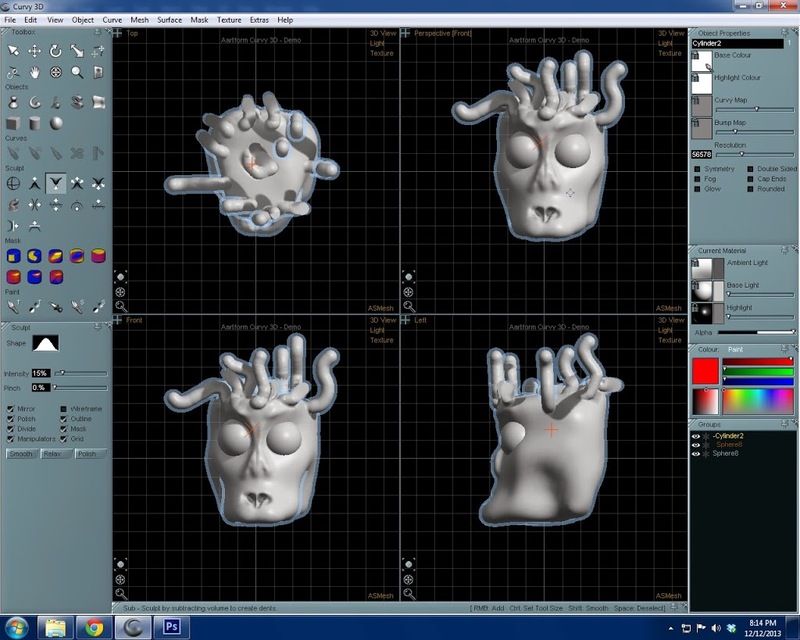 My other thought was to sculpt everything by hand and use the Sense 3D scanner to create models, but really, I should learn how to model digitally. I don’t have the education that Justin has (and that is why he has an INTENSE understanding of models) and don’t necessarily need to. But I need to be able to create organic designs digitally. I need to be able to do more than extrude an .svg file and print that (really, I could just be using a laser cutter, which is much faster and I could work in a variety of materials for that). To truly take advantage of what we are building, I need to model. I’m trying a bunch of programs out, either freeware or on trial basis, in the next few weeks to see how I feel about them and try to judge their ease of use. I want to find a program that a novice could play around with and not be frustrated. The beads are in the oven and will be assembled in the morning. I didn’t really get far enough into Curvy3D start getting into the nitty gritty, but it allows me to start doing what I had planned for in my designs. There is a 30 day free trial (that’s how I’m checking it out) and the normal cost is $99.00. It is currently discounted 25% for a sale price of $74.25. That’s not bad considering the intense investment most other software entails. I plan do to some screen captures and possibly some videos while I’m playing around with it, which I will share here. Some others I am checking out will be Wings3D, Sculptris and Modo. 123D Sculpt (autodesk product) is, unfortunately, iPad only. So that’s not going to be in the running. 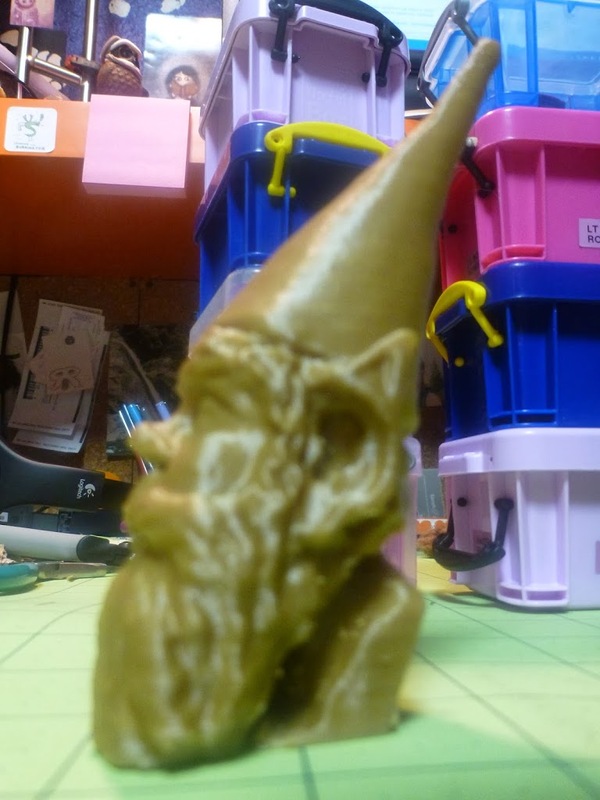 We went to a really great 3D printing meet up on Sunday (it’s been a busy week with Mind-2-Matter and getting ready for finals next week, so I wasn’t timely in blogging about it). It was hosted by Type A Machines and 3DHubs, who just recently unlocked San Francisco. 3DHubs is another print on demand service that required a certain number of printers to sign up in an area prior to “unlocking” a city. We had been watching for months for San Francisco to be unlocked but have been steadily using MakeXYZ to grow our business. We spent a bit of time networking and one of the featured speakers was Made in Space! What’s Made in Space you ask? Basically they are a group that is working on the first 3D printer in space! How rad is that idea? I can’t say we’re working on anything as ground (or space) breaking as 3D printing in space, but Mind-2-Matter getting to be a REALLY exciting project. I’m working on the photography tomorrow morning before we head out to Half Moon Bay. I went through the entire casting process on Saturday from spruing to pouring the investment mold to pouring the pewter! Justin took some video so I will get that posted up tomorrow as well as the photos of Gnorman in various states of being. 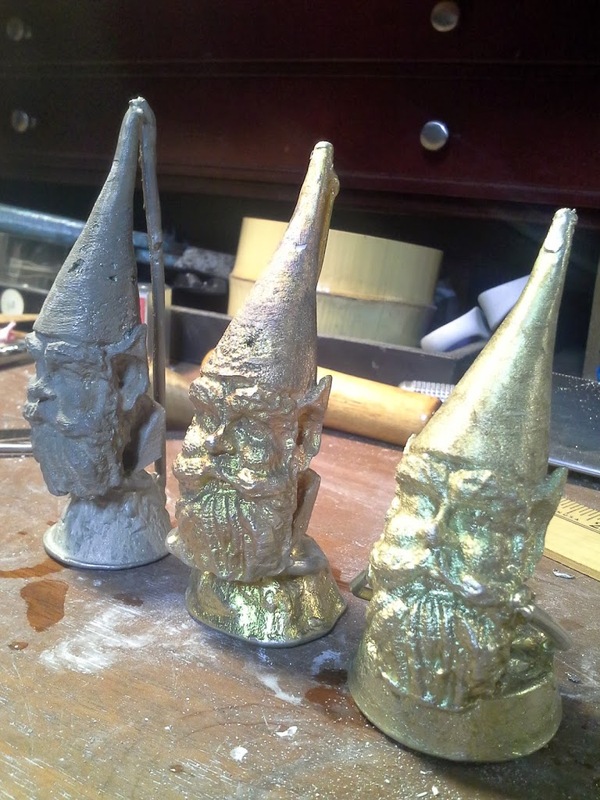 Here are a few of Gnorman from my cell phone (the real pictures will happen tomorrow!). 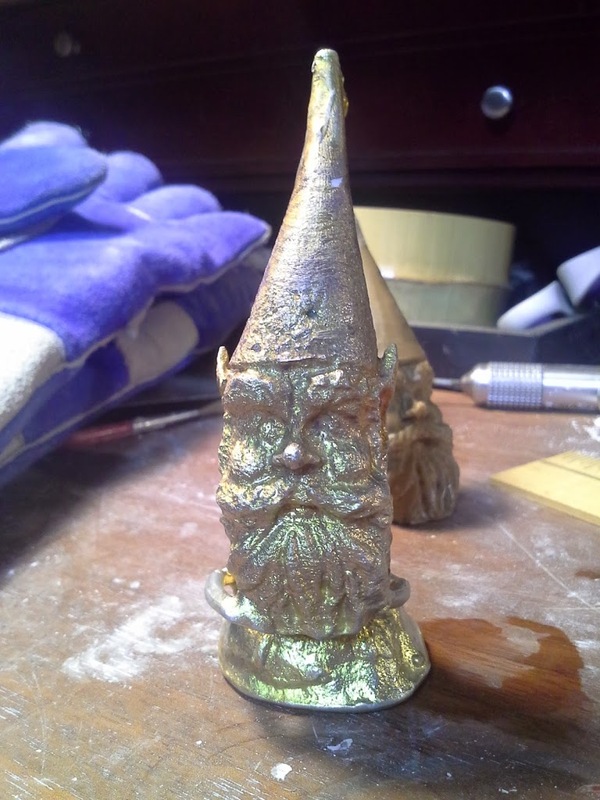 I really wanted to keep a golden Gnorman, but he had to go through the polishing stages! 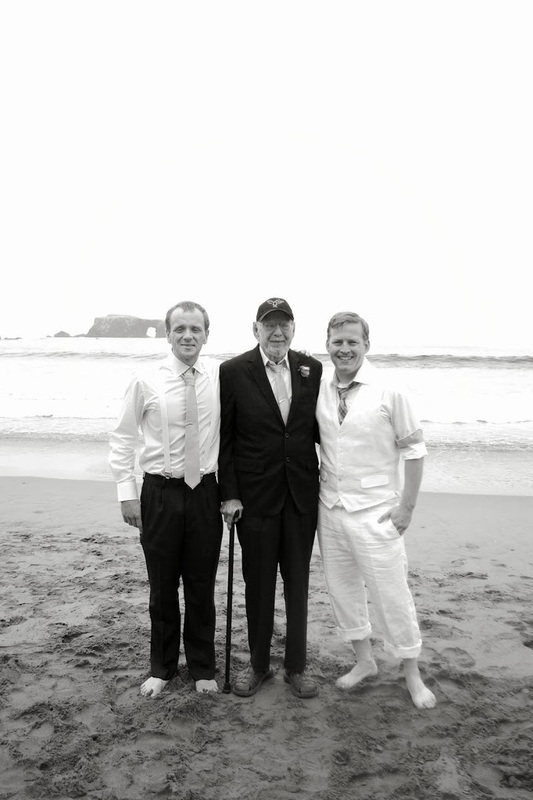 I know I’ve been neglecting the blog a bit. I have been working diligently on projects, especially now that I have a lot more time on my hands. I haven’t really settled into a routine since losing my job. I really think that will help. 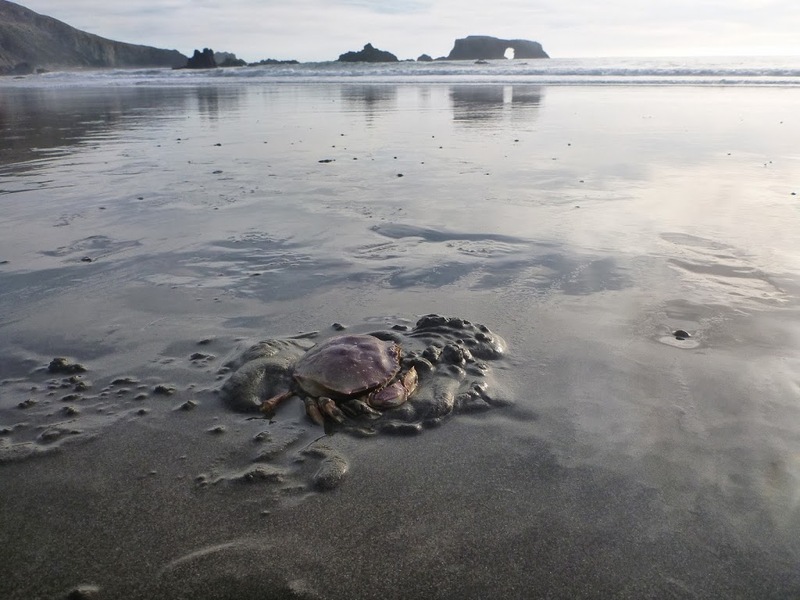 We’re going crabbing tomorrow (hopefully a crabfest will be had tomorrow night!) but I would really like to get a good routine down. 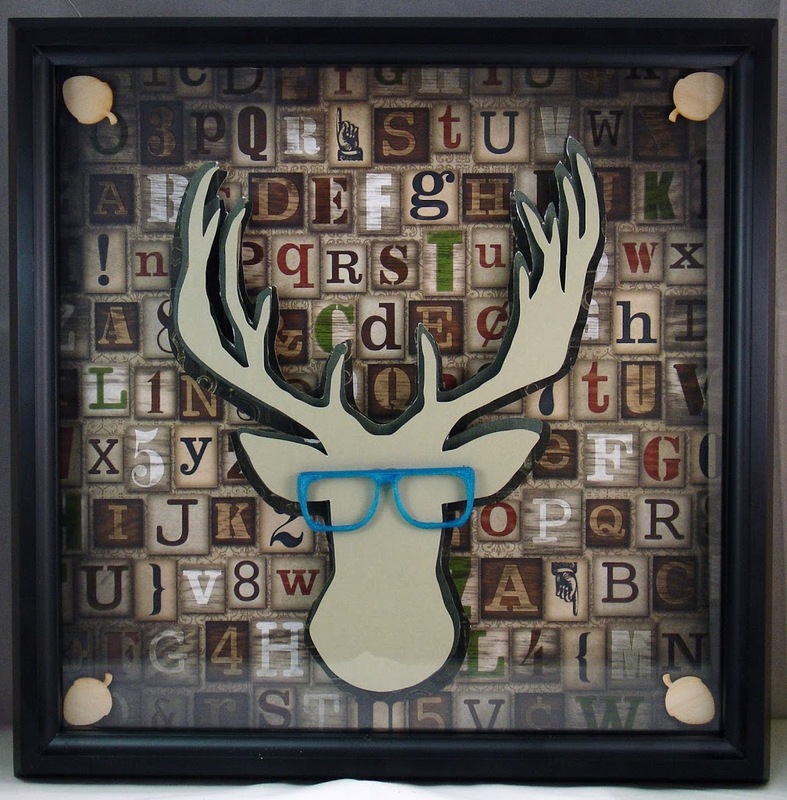 It’s available in our Etsy store and it’s a part of a series of 5 pieces I’m working on. In all honesty, the general crappiness of the eCraft has been the hold up on this and several other projects. Contacting Craftwell has been of little help other than “you’re doing it wrong”. I finally found a blogger at Purple Paper Paradise who apparently knows how to use the machine and is WAY more help than Craftwell’s customer service. I was able to get a few usable cuts following her tips, whereas I was still just throwing paper away trying to “do it right” according to Craftwell Customer Service. Perhaps they need to sit down and watch PurplePaperParadise’s videos in order to work in CS? I don’t like to be mean to CS people, they’re usually doing the best they can with the limited resources and training that they get. I’m more frustrated with companies that offer products with little to no support documentation and you just sort of have to figure out, especially when they purport their product to be easy to use out of the box. I’ve got some additional projects on my list, including Christmas cards. I know it’s a bit late (a lot of people do their Christmas cards Thanksgiving weekend), but I seriously didn’t even think about them until I asked my husband yesterday if he wanted to send any out and if we were going to make them or do a lame photo card. I hope to have cards ready by the weekend. You can always leave a comment here if you have suggestions. I’m really interested to hear if there are letter press plates that people really want to see made for units like the Fiskar’s Fuse or the like. I’ve got the capacity to help make that a reality and have had it on my radar for a while now. I’ve asked friends and family if there were any sort of crafting themes they would like to see but none of them want to craft (everyone is into Instagram to apply filters to their photos but no one actually does anything with said photos). 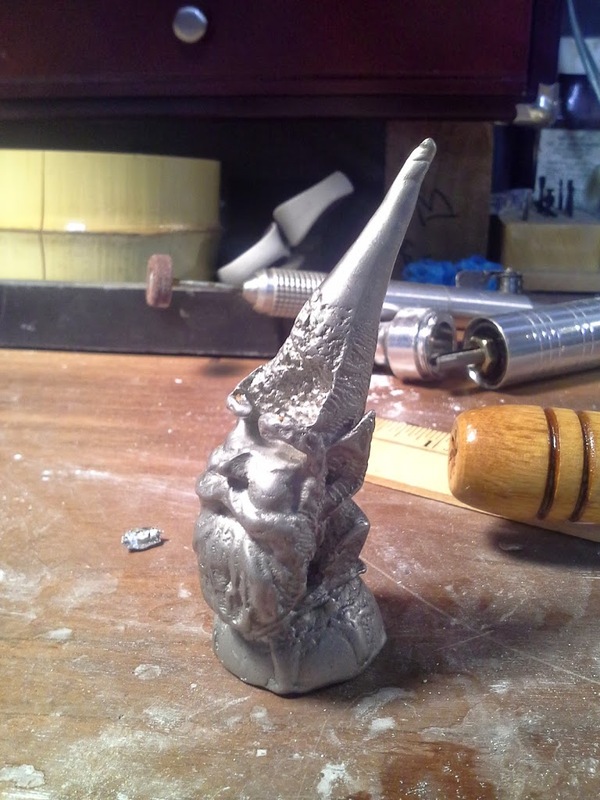 You may remember Gnorman from earlier this year. 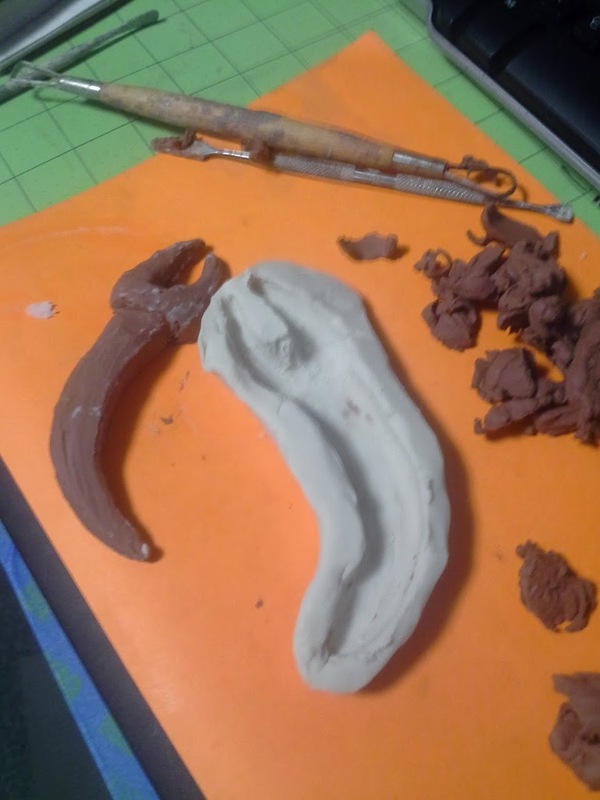 This was my free sculpture for my figure modeling class during the Spring 2013 semester at AAU. This may be the piece of work that I am the most proud of ever. EVER. (and I’ve made a lot of art in the last 30 years). 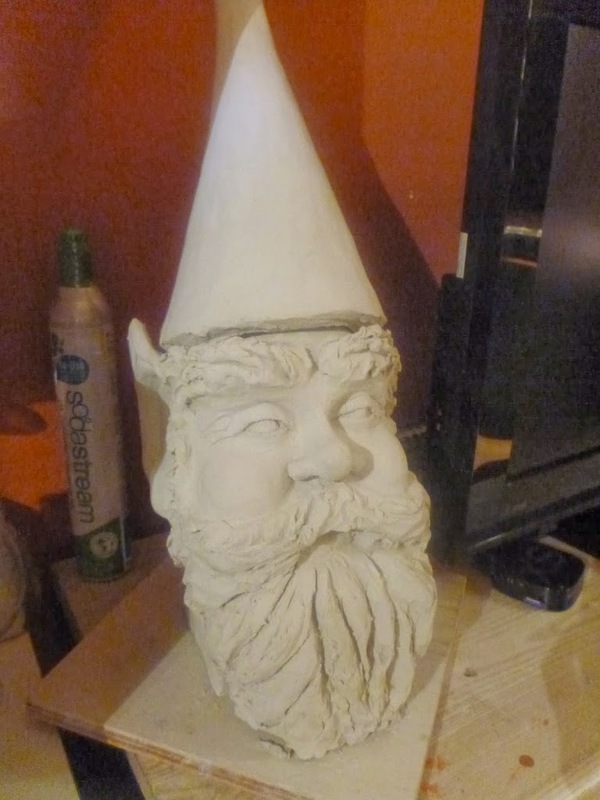 Needless to say I was most saddened when I was too busy to properly finish Gnorman and have him fired (I went straight from work/school to wedding prep/work and he dried out!). I had been crossing my fingers that we could get him scanned before he was a total loss since June/July. Our method of scanning wasn’t the easiest but Justin and I worked through a variety of methods using Kinect cameras for another project and I figured that we would, at some point, rig that set up again. Well, we didn’t have to. 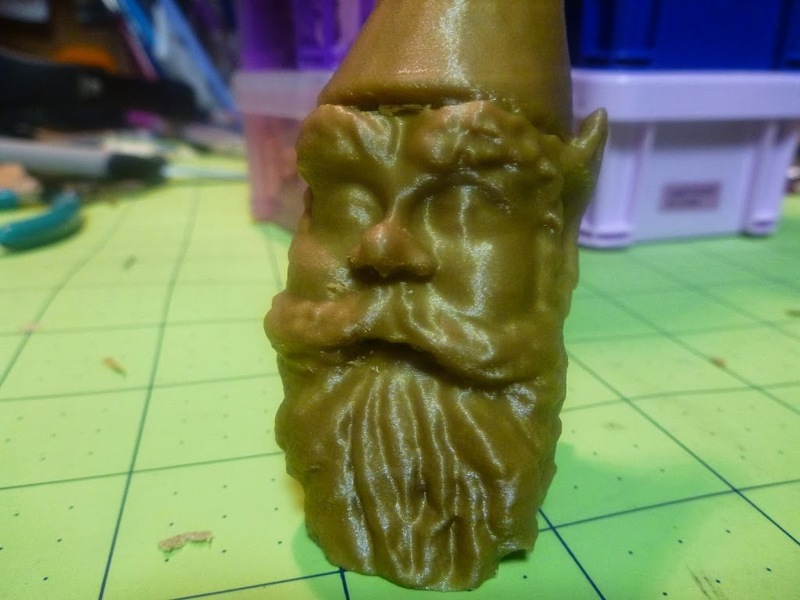 The Gnomes (thanks to the Elder Gnome) have acquired the Sense 3D Scanner. A few minutes time and we had a model to print. I was so excited I could barely contain myself last night! 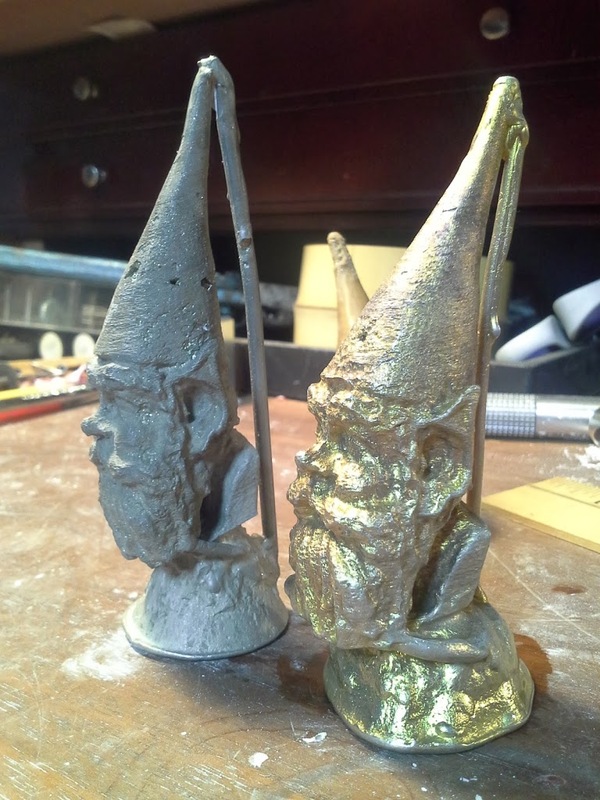 The original Gnorman is 8″ W x 13″ D x 24″ H. New Gnorman is about 1″ W x 1.5″ D x 4″ H! And it was just in time. 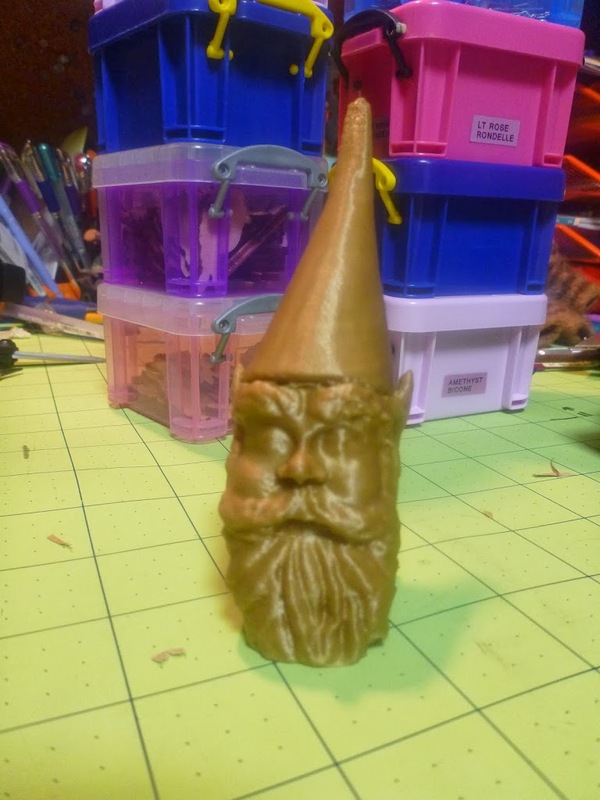 Gnorman’s ear fell off after we finished scan! And a bit of time to do them. I started working on my to do list for projects tonight when I got home. It’s long. But I’m totally stoked. I took a drive to the coast today while Justin was working. Pi and I drove through Sebastapol. I had hoped to get apples so I could test my pie crust as an apple pie. While they grow apples in Sebastapol, it’s not quite Apple Hill. There aren’t a ton of farm stands. There isn’t a lot of variety. I stopped at one place and they only had one variety of apples. ONE! 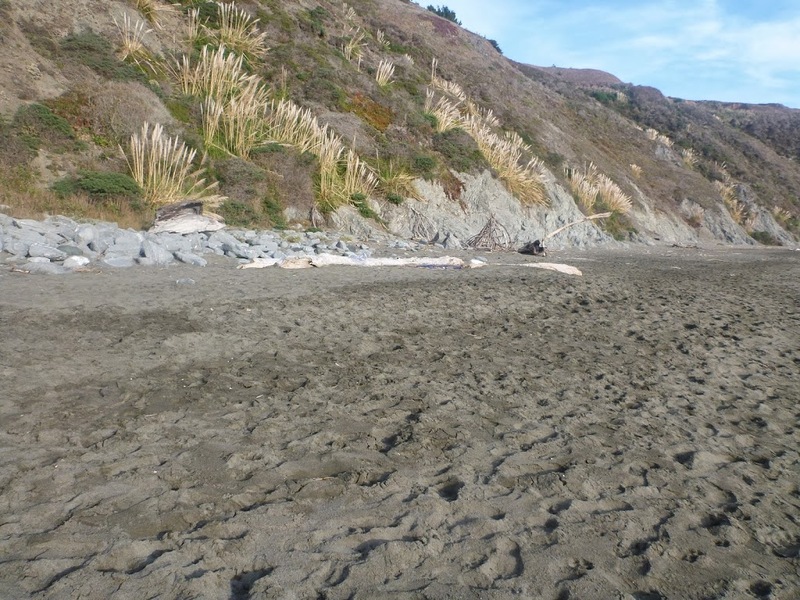 We continued on and went to Duncan Mills to get coffee and over to Blind Beach. I was happy to see that the “pews” from our wedding were still sort of there! The last row of our “pews” was still in place. One “pew” has been partially buried. I wasn’t going to to today, but Justin really encouraged me to do it. And it was awesome. The weather was great. 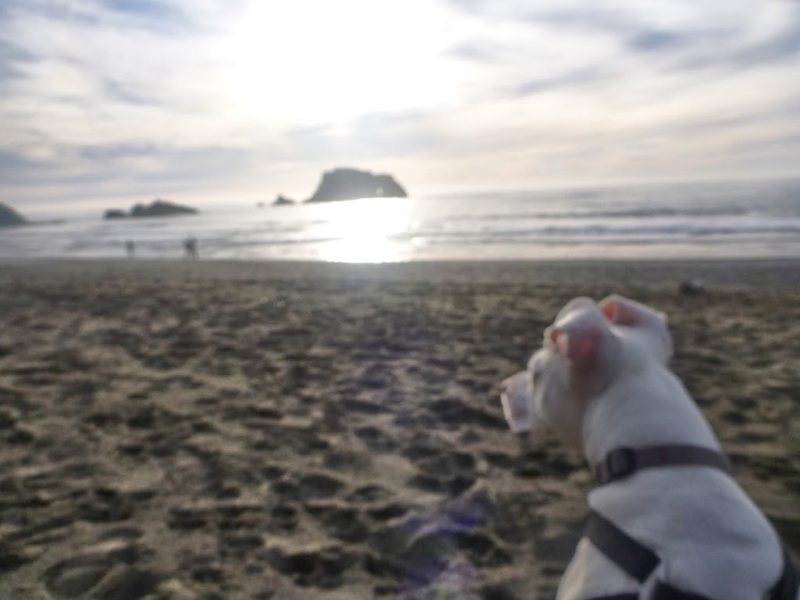 Pi and I walked on the beach and just sat for a while. It gave me some time to disconnect (no phones/internet/etc) out there and to actually talk with people as Pi played with their dogs. I’m pretty stoked about Thanksgiving. We’re getting together with Justin’s family the weekend before and my family on thanksgiving. I’m in charge of pie and biscuits. I’m making my super delicious pumpkin pie and sweet potato biscuits. It’s kind of cool that my family is trying new things for Thanksgiving this year (it’s a gluten free Thanksgiving for the most part). One thing I’m going to test this week for sure is trying a real food version of my mom’s cranberry salad. The version we’ve been making forever uses Jell-O but in an attempt to ditch the artificial colors and flavors, I’m going to rework it with raspberry juice and gelatin. I’m really excited because it is one of the best parts of the holidays that we started making the year we had an “Amish” Thanksgiving with the Gauthier family when I was a kid. The Pictures of our Big Day! Our wedding photos finally have come to us! Which got me totally distracted and I did not do any art tonight. I posted wedding photos on Facebook. and did some yoga. Did I mention how much I like yogaglo?! You can search by body part! They have a bunch of practices for psoas and IT work. Which I need. Immensely. A lot of people need to release their psoas and IT band and don’t even realize it. A lot of times it manifests as low back or knee pain. I did a moon cycle practice and open shoulders. And during my yoga, I noticed the Ratinator did work. It’s been a while since we had seen any evidence of mice or caught one. So obviously they are not totally gone. I think of all of the wedding pictures, this may be my favorite. Jesse isn’t there in the physical sense, but it’s like he’s there.